I’ve done my kind of spiritual reading mistakes. I love reading and I love reading for growth, but I’ve relied too much on my memory and honestly–after I finish the book, I tend to forget what has helped me reflect as I was reading it. Now, I’ve always been a reader, and a lover of books. It wasn’t until a few years ago that something switched within me, and I’ve been primarily focused on books for growth. I think this is awesome and a bit problematic. Let me explain. I’ve love collecting the amount of books that I’ve read. I love plowing through them and checking them off my list. However, spiritual reading is a bit different. There is no plowing, there is no speeding through. It’s only you, the words, your reflections, and God. And trust me, there is no time limit for this. These are some mistakes that I have made, and what I learned from it. I need to get into this practice more, but a common place book is a great way to keep track of what you’re reading, and to keep notes. I’m a dabbler, so I’m not sure if I want to do it with paper and pen or all electronic. Eventually, I’ll be writing it down in a notebook, but when it’s digitally, it’s just easier to cross things out and move things around. Before, I would just highlight my book. But, that’s not note taking. I still highlight–a digital book, but I tend to write my notes for a physical book down separately. Occasionally, I’ll put a star or an asterisk on a certain passage. I don’t really like to mark up my books, it in a commonplace book, you can do whatever you want. That brings me to my second point. Listening — Self-help, nutrition, health, would fall under listening. There are times where these categories would cross into something else, but generally, I listen to these types of books. Physical — Prayer books are mainly physical. Then there are some digital books that made it to my physical stash. I don’t usually have a lot of space for my own books, but if it’s worth it, it will be on my shelf so that my kids can stumble upon a really good book. I always “planned’ on doing this, but I never really made myself sit down and really organize my notes from my reading. Since I’m no longer to the point of reading for the sake of just finishing books, I have the freedom to stop, and sometimes re-read the book. I do this even after I just finish reading it. It’s a great way to know that I haven’t missed anything, and that I’m really putting to pen (or keystroke) words that I really want to take seriously. The best part of reading for spiritual growth, is to just have fun with it. Accept that some readings are just going to be hard. Other, may simply be a gut check where you’re being called out, and you recognize that there is something for you to work on. Hard as it is to accept, I just accept that, and try to adjust accordingly. I do read these books for “fun” because I can’t possible see a better way to have fun then to grow yourself and apply yourself in everything that you do. I still have a long way to go with growth, and reading, but these are just the few things that I realized along the way that has helped me a lot. What have you done to help you in your spiritual reading? Do you take notes as you read? I really want to know. Share your thoughts in the comments below! 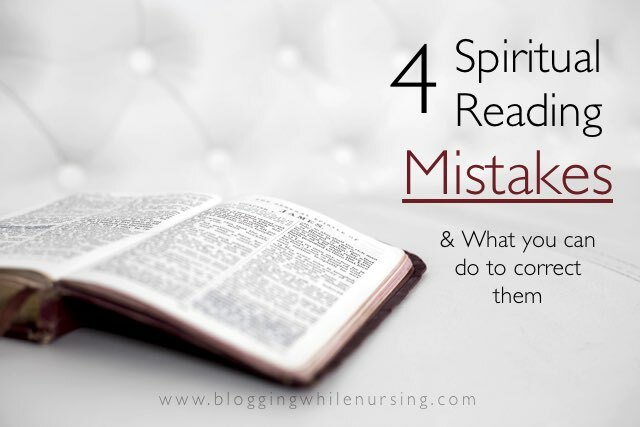 2 Comments on "4 Spiritual Reading Mistakes"